English Menu? No menu for brunch hours. Kids’ menu? No, but picky kids can order from the a la carte menu, which features macaroni and cheese, chicken nuggets, chicken noodle soup, grilled ham and cheese and more. 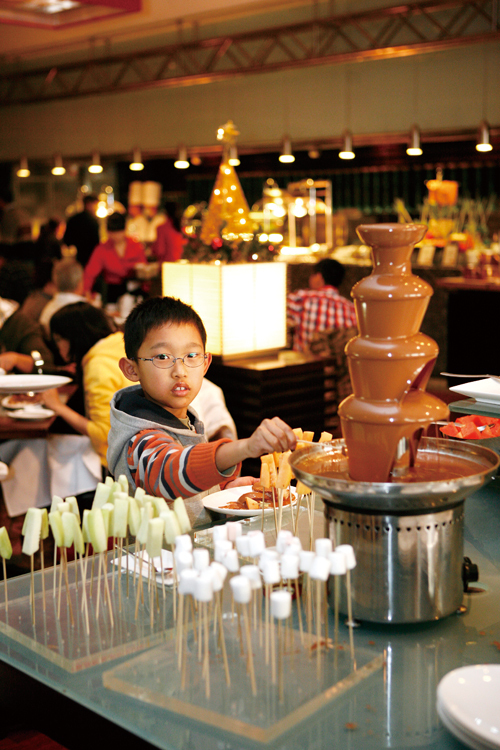 General kid friendliness of menu: The buffet has a wide variety of food that is sure to satisfy even a picky eater. The dessert bar boasts scrumptious cheesecake, marshmallows, Häagen-Dazs ice cream, pumpkin pie and plenty of other goodies to keep kids coming back for more. Staff: Staff speaks English and is happy to serve. Bathroom: Well-kept, sit-down toilets. There is a changing table. Best dishes for kids: The pizza or dessert station. There’s also fresh fruit. Kids’ play area? There’s no designated area for kids, but guests are entertained all afternoon with live musical performances. Seating: Standard seating with highchairs available upon request. Price: RMB 458 includes unlimited alcoholic beverages (inclusive of champagne from six different wineries in France). RMB 338 includes soft drinks. Kids aged 6-12 are half-price. There is a 15% surcharge per person. Accepts credit cards? International credit cards are accepted. Must-order item: Seafood is a must, and keep an eye out for special promotions, such as fresh Alaskan salmon. In a nutshell: This buffet has something for everyone while keeping families entertained for a Sunday afternoon. Staff works hard to consistently provide the freshest and most popular dishes.